A seriously new sport that combines elements from the games of soccer, volleyball, basketball, and ultimate. Note: While these detailed rules of the game may seem lengthy, compare to the PGA’s 50-page rulebook, basketball’s 80 pages, FIFA’s 138 page “laws of the game” or the 268 page official rules of volleyball. Use any body part to juggle, bounce, or pass ball. If ball contacts any part of the forearm or hand, hand must be in a closed fist (base of the fingers at a 90 degree angle to the back of the hand with fingertips touching the palm. If any part of the fingers are in line with the back of the hand, hand is not in a fist.) No catching, throwing, holding, or lifting allowed. Open-hand foul results in serve for opposing team at spot of foul. Open-hand by defense behind own shot line results in offensive serve from outside of shot line (“shot line serve”). Ball must be cleanly struck with an immediate and apparent rebound. Any amount of prolonged contact is a carry, stall, or push foul. A player can use up to four consecutive touches (regardless of bounces). A bounce does not count toward or reset the number of touches. Five touches by one player is a turnover at the spot of foul. Striking or attempting to strike the ball with two separated arms / fists or with two body parts simultaneously is counted as two touches, regardless if both body parts actually contact the ball. If hands are interlocked (i.e. volleyball bump pass) this is defined as one touch. If hands are parallel (in contact but not interlocked) contact with ball is defined as two touches. If hands are interlocked (i.e. volleyball bump pass) this is defined as one hit. If hands are simply touching, not interlocked, this is defined as two hits. Ball can bounce on the ground once between any contact. If ball bounces twice, the team touching ball last loses possession. Defending team serves from own shot box if the second bounce (regardless of where player touched ball) occur on own defensive half. Defending team serves from behind the half line if second bounce occurs on own offensive half. Defending team serves if second bounce happens in own shot box, regardless of who touched ball last. When a ball is simultaneously contacted by two players and two bounces follow, offense (team that made prior touch) maintains possession with serve, unless bounces occur in shot box (defending team serves). No high kicks. If another player is within arm’s or leg’s reach of the ball (playing distance), thigh must remain parallel to the ground or below, and feet must remain below the waist. The Serve. Start game by serving to own team from anywhere in own shot box. Player must be stationary to serve. Pivoting on one foot is allowed. One foot must remain stationary upon serve. All serves are indirect (cannot score with serve). Serves can occur from anywhere behind shot line or half line (according to where second bounce has occurred.) A serve that bounces twice is a turnover. Server must hold the ball then use one touch only to deliver it to any other player. If server makes two consecutive hits upon serving, opposing team takes possession at spot (or behind service line if serve was from shot box.) Serves can occur from anywhere behind appropriate line (service line / half line) and can be played in any direction. Possession Rule. When a player makes a controlled contact with the ball keeping it in the air (i.e. juggles, taps, bumps, hits ball to himself) and the ball remains within his reach, he is in possession. If player’s fist is extended above top of head, player is not in possession and ball is available to any player. Simultaneous contact by two players is in possession of offense (team that made previous touch). After this initial contact with ball, defender is not allowed to touch ball or ball handler. A defender who contacts the ball within the ball-handler’s arm’s length during possession rule protection has committed a foul even if stationary. If ball handler allows ball to touch ground during his possession, defender can intercept, regardless of the number of touches handler has used. Contact. When attempting to contact ball and prior to doing so, no player is allowed to make contact with another player. Minor, incidental contact following touch of the ball is acceptable. Heavy, obstructive, or questionable contact from any player is a foul and opposing team serves at the spot of foul. If contact is mutual, ball is awarded to the offense. Incidental contact is allowed among players away from the ball. Contact that affects movement is not allowed. No intentional contact or obstruction (screen) is allowed. No sidelines in open field. If a fouled player retains playing advantage (maintains possession, has shooting opportunity, completes forward pass), play will not be stopped unless the foul is flagrant or injury occurs. If a point is scored, the fouled team may decline the foul. Possession rule does not protect offense in shot box. Defender can intercept ball at any point. Possession rule protects defense in shot box (as in open field). Heavier incidental contact is allowed in the shot box provided players are in reach of and clearly trying to play the ball. Holding one’s position despite contact is allowed. No tripping, pushing, kicking, checking, hitting or other blatant contact or intentional obstruction is allowed. Ball or body part on the oval line is in the oval. Ball or body part on the baseline (away from oval) is out-of-bounds. A point is awarded for any ball touching the ground (landing) in the oval from the air on the first bounce. Shots are allowed from anywhere with any body part. Area in the air above the oval or out-of-bounds is in play if player is not touching the ground. If any player steps in the oval or out-of-bounds, he is out-of-play until ball is dead. 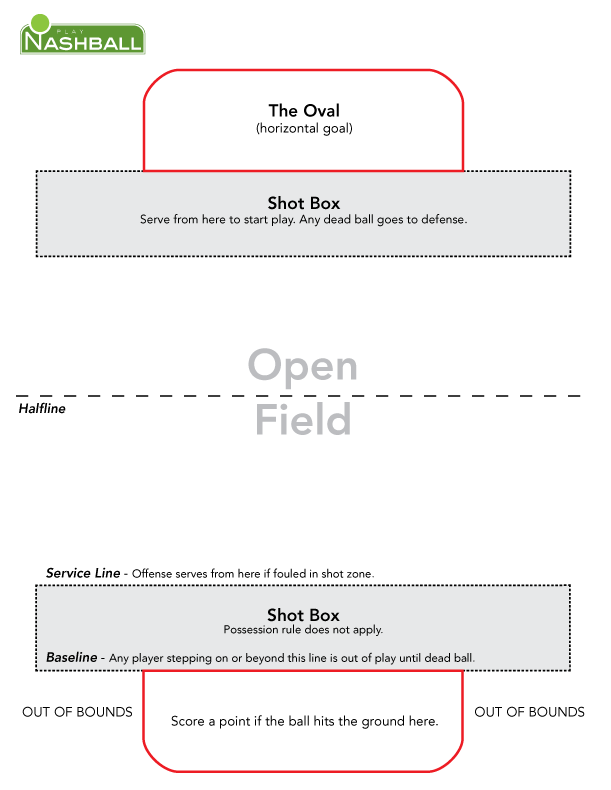 If defender touches the ball after touching out-of-bounds, offense serves from behind shot line (“shot line serve”). If a defender touches the oval, any ball that touches him until the ball is dead is a point for the offensive team regardless of his position after touching the oval. An offensive player attempts to score (with 4 total touches) starting from the half line with a defender in the shot box. Ball is in play until dead ball. Each team is given three attempts by different players. The winning team is given an additional attempt for each point it is ahead. A tie is ended with additional attempts by different players from each team equally until one team falters. Only current players on the field are allowed to participate and the lineup is cycled through. Defender can be any player. The oval is a rectangle, with rounded (1 yd radius) back corners (a.k.a. half-rectoval) measuring 12 feet (3.7m) in depth and 24 feet (7.3m) in width. The shot box is a rectangle measuring 15 feet (4.5m) in depth and 54 feet (16.5m) in width. Field width must be at least 30 yards (27.5m) with no maximum width. A regulation nashball match contains two, 40-minute halves, with at least a 10 minute break between. Teams defend the opposite oval after the half. The clock, held by one scoring judge (or timekeeper), moves continuously. Substitutions occur upon a team’s own shot box serve. When an injured player is on the ground for more than 15 seconds, the clock is stopped and resumes upon the next serve. After a dead ball, the last team to touch the ball must make a visible effort without delay to recover the ball or a game warning is possible. Once all players (including substitutes) are in position, a serve is made within (approximately 10) seconds after the server receives the ball. After failure to serve in reasonable time from the shot box, opposite team serves from the half line. If service delay occurs at the half line, opposite team serves from own shot box. Following the serve, the second teammate must touch the ball first or or serve is repeated. Defense is not allowed to obstruct any player or ball prior to the offense receiving the serve on its own half. Standard defensive rules apply if offense receives serve beyond the half line. If the defender steps in the oval, he or she is out of play until dead ball. If the defender steps out of bounds, the player is allowed to re-enter the field and continue play provided he or she does not touch the ball while out-of-bounds. All serves are from the shot box except in the case of a foul. This version can be played in a small space (20-30 yds between ovals). This is an effective way to practice shooting accuracy and is a great workout. An ideal play is for the defender to successfully keep a blocked shot in play and counter-attack. 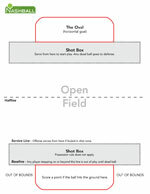 Play begins with up to four touches starting from one’s own shot box (no serve). Shots scored from beyond the half line earn one point. Shots scored from behind the half line earn two points. Shots scored from one’s own shot box earn three points. After a dead ball, the game continues as quickly as the new offender can retrieve the ball and put it into play. Balls initiated by the defender that bounce twice within his or her own half (not initiated from shot box) are brought into play by the offense from the half line (as with team play). One player is assigned to defend each oval and score on the opposing oval. Each defender is allowed one serve per round. The third player begins at the half line and attempts to intercept from either player to cause a dead ball. Players rotate in round-robin fashion until each player has played the middle position. The player with the most ovals after the three rounds wins. Any ball touching anywhere beyond the baseline is out-of-bounds, as in the outdoor game, back wall included. A ball touching any other surface (walls, ceiling) is in play. Bounces are defined only as the ball touching the floor..
To score, the ball must touch the oval on the first bounce without hitting any other object. The oval is smaller (approximately 18′ x 8′). If a ball hits the sand and ceases bouncing, the offense (team who touched it last) is allowed to scoop the ball up with one hand or foot. This must be done is in a fluid motion without stalling. The player cannot be the same player who made the original contact. Ball can be scooped up to oneself or passed to another player. The scoop counts as one touch. After being scooped, a ball bouncing twice or becoming stationary without touching another player first is a turnover.